Marine approved stainless steel diaphragm pressure transmitter with 4-20mA current loop output for shipbuilding in ranges from 100mb to 600 bar gauge or absolute. The DMP 457 marine pressure transmitter has a silicon strain gauge sensing diaphragm protected with a stainless steel oil filled capsule which is compatible with marine applications such as diesel engines, compressors, pumps, boilers, hydraulic and pneumatic controls. The DMP457 pressure transmitter is LR (Lloyd´s Register), GL (Germanischer Lloyd), DNV (Det Norske Veritas), ABS (American Bureau of Shipping) and CCS (China Classification Society) for marine use and can be used below deck on ship systems. ATEX/IECEx approved for intrisically safe use in hazardous environments the DMP 457 marine pressure transmitter is also available for ship systems which are handling flammable and volatile chemicals such as oil, gas, liquid petroleum gas (LPG) and liquid natural gas (LNG). Install pressure transmitters on an existing tank gauging system that uses pneumatic pressure signals to monitor the level of ballast or liquid cargo, so that a 4 to 20 milli-amp signal can be fed into a vessel performance monitoring system. What kind of cable coating is on the IP68 version of the DMP458? 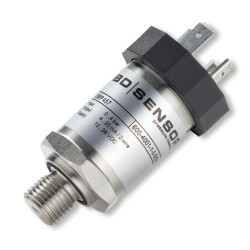 We have pressure tested a DMP457 pressure sensor with a flush diaphragm to 40 bar on water. After the test we noticed a small crease on the Stainless steel diaphragm. Is this something which can happen in normal use and will the crease have any effect on the performance of the sensor? If it’s a shallow crease, for example less than the visible surface convolutions it should be ok, but you might notice a very slight offset. The DMP457 has an isolation diaphragm which is back-filled with oil so a reduction in volume will put slight pressure on the sensing element inside. It’s not normal to see surface damage unless there has been cavitation, overpressure or physical damage during installation. It’s very easy to damage the isolation diaphragm with a point load, for example a screw driver or pencil will very easily dent the surface since it is only a few thou thick. In normal use when air or liquid pressure is applied, the load is distributed evenly across the diaphragm surface. 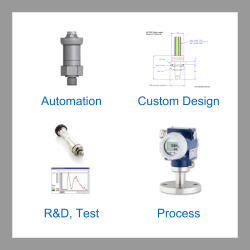 Please select the options you require for the DMP457 Marine Approved Pressure Transmitter in your application and request a quote. Send us your enquiry for DMP457 Marine Approved Pressure Transmitter to get assistance with this product type.